Will you help us advance our mission of affirming life through extraordinary, compassionate care and support for the seriously ill and grieving in the Southern Tier? Here’s your guide to getting involved with CareFirst in 2019 – from volunteering, honoring your loved one at a grief event, finding the support you need to build caregiver confidence, or giving back to hospice by supporting a fundraiser, you’ll find out how you can make a difference in your life below. Did you know that less than half of our hospice patients have cancer? As more and more people are living with chronic diseases such as congestive heart failure and COPD, our care plans have adapted to meet the needs of our patients. This spring we will be revitalizing disease specific programs, Lifebeat and Breath, to provide specialized care and support for individuals with end stage heart disease or pulmonary diseases. Learn more about our clinical programs by contacting WulfP@carefirstny.org. Caregivers receive hands on respite training in a home like setting at the CareFirst Skills Lab! For caregivers- did you know CareFirst has a hands on skills lab that mirrors a home setting, where you can learn how to care for your loved one with confidence? 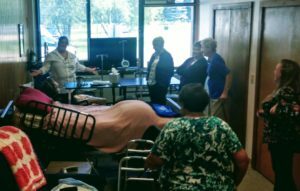 Monthly workshops will be offered the 3rd Tuesday of each month from 4-5pm; here you can learn how to safely care for a loved one who is bed-bound, durable medical equipment usage, mobility tips and tricks, medication management, advance care planning, and so much more! If you have a group that would like a personalized workshop, just ask! We can work with you to create a learning experience that will make a difference in your life. Sign up today by contacting Litzr@carefirstny.org. A revamp of our outreach and education initiatives are a top priority this year. If your office, medical facility, church, civic club, or organization is interested in learning more about CareFirst, reach out to Development@carefirstny.org to schedule an in-service or speaking engagement! 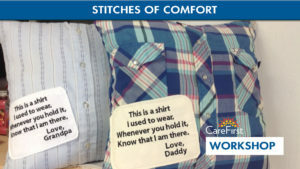 Make a pillow from your loved one’s favorite shirt! 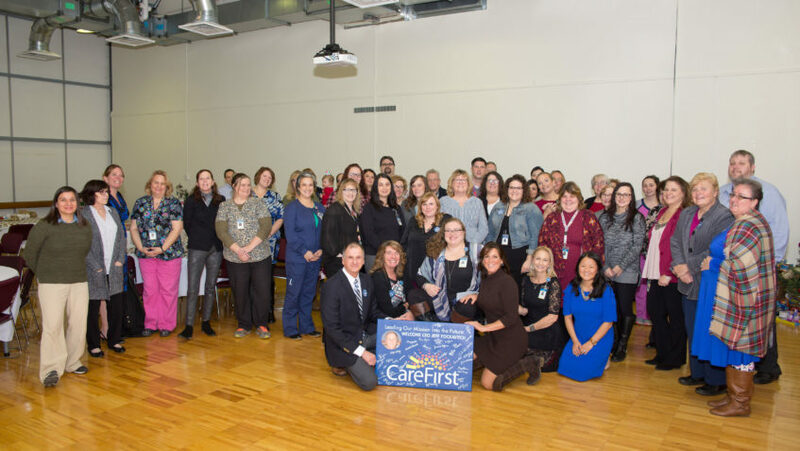 CareFirst Grief Services has an extensive calendar of events planned for 2019, including ceramics, support groups, pillow making from a loved one’s favorite shirt, Good Grief Day for children, a grief workshop for teens, book club, and so much more! Our team of professionals can help you along your journey of grief at the Clinic for CareFirst. Follow us on Facebook for details, or email Griefservices@carefirstny.org. Speaking of events, CareFirst has a reputation for coordinating some of the best fundraisers in town! Our annual geranium sale, Petal Pushers, kicks off in April- with 16,000 flowers to sell, we are always looking for help! 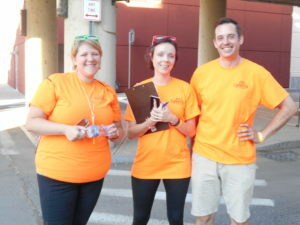 Ready, Set, Glow, our night race in partnership with the Elmira Street Painting Festival, will take place July 13th; help us light up the night for hospice by registering to run, volunteer, or be a corporate sponsor! Send an email to Development@carefirstny.org for more information! Have you considered giving your time to CareFirst as a volunteer? Opportunities are endless, from patient care visits, to clerical help in the office, and fundraising events – if you have the time and the passion, we have a place for you! To learn more about how you can help, contact our Volunteer Department at Volunteer@carefirstny.org. This is just a tip of the iceberg for the year; visit our website, Facebook page, Twitter, and YouTube for up to date information and announcements!